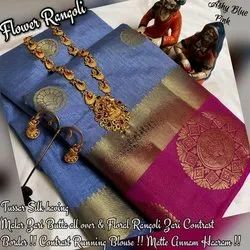 Offering you a complete choice of products which include wedding wear kanjivaram silk saree, traditional self design kanjivaram silk saree, kanjivaram silk sarees, moonga silk saree, designer kanjivaram silk saree and kanjivaram tussar silk saree. 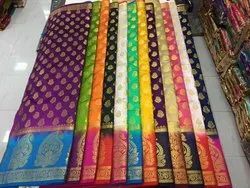 Blaton Silk, to expose the Beauty of Queen.. Getting Into the market with new colour combination. 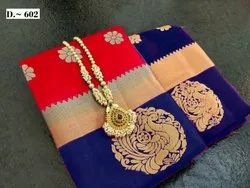 Description - Heavy Zari Border and Design Embossed all over the body with Rich Pallu specially made for Festival season. Festival Delight Outfit !! Exclusive Design ! !Vibrant Colour Combinations !! 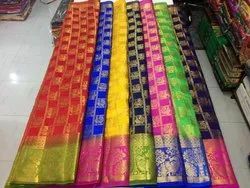 - Hits Holi Celebrations .Saree - Art KANJIVARAM Silk have Embossed Design & Peacock Zari Butta all over the saree !! Contrast Elephant Delight Zari Border.Blouse - Running contrast Blouse Peacock Zari Butta all over the Blous.We Promise Best quality Product! !Note- No any Jewl Set . 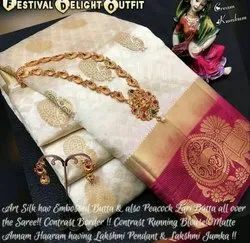 Back with new colours Grab it soon..Ideal Gift saree Kanchivaram Semi Soft silk : with original supervisor quality of silk yarn and feel the softness of the saree for any season you can gift your loved ones with his embracing silk saree for this festive season ..it can be a surprise gift to..
Rich Mango Moonga silk Look grandeur in this festive season with our rich grand moonga silk collections. 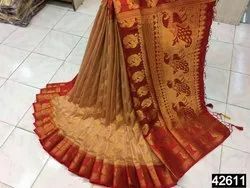 Feel like a queen in our rich moonga silk sarees with all over butta and rich border and a rich pallu that adds elegance to the attire and a contrast blouse with heavy jari border.